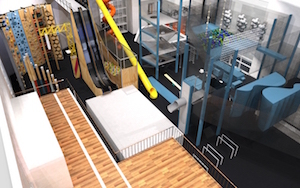 Surf Snowdonia, known for its inland Surf Lagoon, has recently worked with Hangfast on the design, development and manufacture of its new Adventure Parc. Hangfast has created nature-inspired indoor activities for the location, designed for participants of all ages. The indoor Adventure Parc is made up of a multitude of experiences, which include an aerial assault course, indoor via ferrata, one of the largest artificial caving systems in the UK, an urban parkour and ninja trail, an air bag jump from three different platforms, four fun slides, 11 fun climbing elements and a double zipline the length of the Surf Lake, which takes centre stage. Hangfast expects the installation to be complete in late June and open to the public in July.